We will discuss Acupuncture, Chinese Bitter Melon, Collodial Silver, Manganese, Massage, Vitamins, Prayer, Reflexology, Yoga, Zinc and others you may tried. 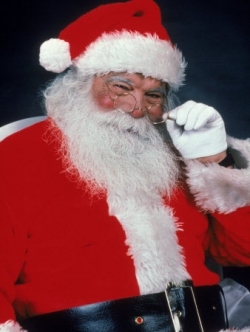 Wednesday Night will have a “Dirty Santa” AND a Xmas Buffet the Wednesday (December 21, 2011) before Xmas. Each person is to bring at least one wrapped gift (value $5.00-$10.00) and a small appetizer or dessert. Also bring a small food item, preferably an appetizer or dessert. This is not supposed to be a large buffet dinner. Just a snacks. By popular vote, we will have a “Dirty Santa” AND a Xmas Buffet the Wednesday (December 21, 2011) before Xmas. Each person is to bring at least one wrapped gift (value $5.00-$10.00) and a small appetizer or dessert. If you can afford to bring 2 gifts, please do, so that anyone new or who doesn’t see this email, will be able to participate in the gift exchange. Also bring a small food item, preferably an appetizer or dessert. This is not supposed to be a large buffet dinner. Just a snack. Dirty Santa Rules will follow. A look at music history in gay culture in thru the eyes of DJ JimmyP in NYC. 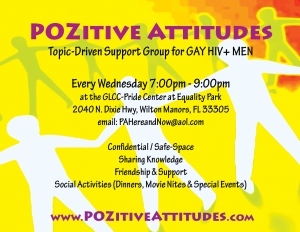 This Wednesday, September 28, 2011, we’re having a guest speaker, Dave Wallace, Director, Public Policy Advocacy-Community Impact from United Way of Broward County. As part of our Campaign for the Common Good and participation with United Way Worldwide’s Income Mobilization Initiative, we are holding Community Conversations across Broward County. We want to gain a better understanding of people’s aspirations for our community; their concerns, hopes and vision for our future. This forum will provide participants an opportunity to give voice to those aspirations and concerns, and engage them in finding solutions. These conversations will, also, help guide us in building strategies to engage the people of Broward County to realize those aspirations. The Community Conversation is an informal gathering of no more than 15-20 individuals, sharing a meal in a familiar setting. We will guide the conversations, but primarily listen and record the discussions of the group. 1. It is a ‘kitchen table’ conversation. Everyone participates, but no one dominates. 2. There are no right answers. 3. Keep an open mind; listen carefully to other participants and try to understand their point of view. 4. It is ok to disagree, but remain respectful of each other. 1. What kind of community do you want? What are your hopes and aspirations for your community? 2. What are the obstacles/roadblocks to your hopes for your community? 3. What can or should be done to solve these problems? 4. What can be done to improve the financial stability of individuals and families? This is an opportunity to make yourself heard so come join the conversation. Food will be provided.